As promised, this is a quick follow-up to my Lucia and lussekatter post. In my efforts to provide a great recipe for Lucia buns that are common for the Lucia celebration on December 13th in Sweden, I tried two different recipes. The results left me with around 55 good-sized sweet saffron buns for a family of four (and two of us count in the toddler age group). Of course I froze several of the buns, but as good as they are, there is a limit to how many one person can consume, and there is only so much space in our small freezer. So I started thinking about other ways I could use them up. 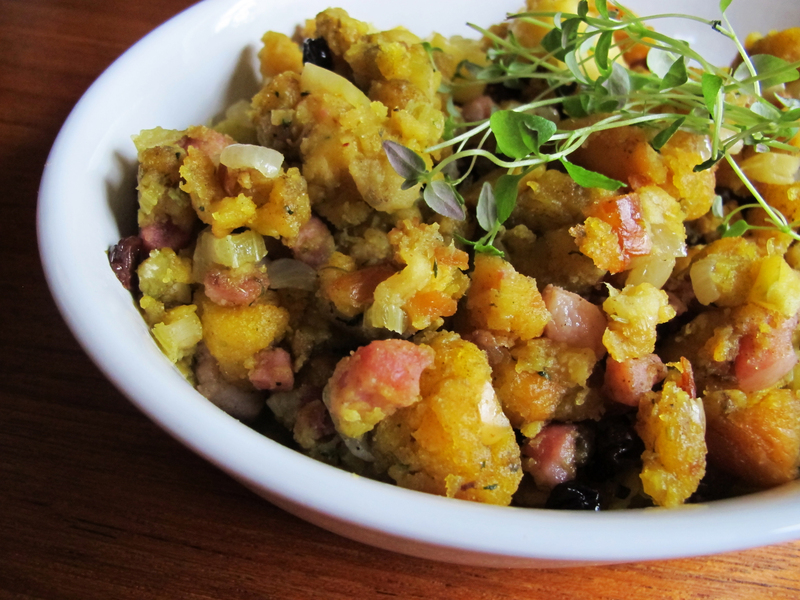 One of my all-time favorite comfort foods is the stuffing that my dad makes for Thanksgiving. Packed with apples, celery, sage and dotted with currants it is one of the best parts of the holiday season. So I took his recipe and used it as a jumping off point for a dressing made out of the Lucia buns to go with roasted chicken. Because the buns are a sweet dough bread they need to be countered with substantial savory ingredients. Adding bacon and chicken stock balances out the flavors leaving a subtle sweetness with a definitive hint of saffron. When roasting a chicken use a shallow roasting dish that will allow the chicken to brown nicely. My favorite dish is from IKEA and you can see it in the roast chicken with rose hip glaze post. 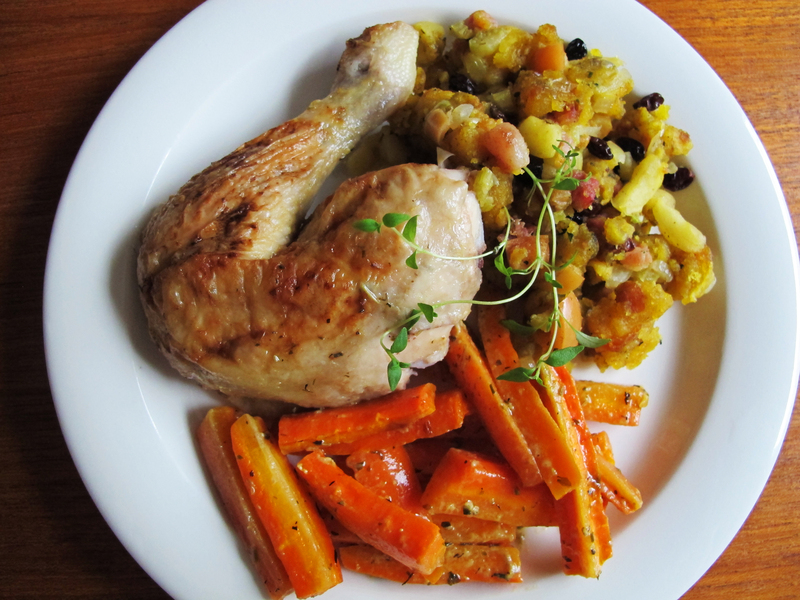 I used carrots to surround this chicken but you could use other root vegetables, onions, apples, or potatoes. You can use pretty much any combination of your favorite roasting vegetables. Just be sure to cut them into a size that will mesh with the cooking time so you don’t end up with vegetables that are under or over-cooked. 1. Preheat the oven to 375°F (190°C). 2. For the chicken, combine 1 tablespoon olive oil with the mustard, thyme, and juice from half of the lemon in a small bowl, blending well. Juice the other half of the lemon as well but reserve the juice for another use and save both of the rinds. 3. Place the carrots in a shallow roasting pan just large enough to hold them and the chicken. Toss the carrots with one tablespoon of olive oil, one tablespoon of the thyme, and season with salt and pepper. Spoon half of the mustard mixture into the cavity of the chicken, rubbing to coat it thoroughly. Place the lemon rinds, garlic cloves, and thyme sprigs in the cavity. Rub the rest of the mustard mix over the outside of the chicken and place it breast-side up in the roasting pan, tucking the carrots around the bottom. Bake the chicken for about 1 1/4 hours until the breast meat reaches 160°F (71°C) and the dark meat reaches 170-180°F (77-82°C). Let it rest for a few minutes before serving. 4. While the chicken is roasting, work on the stuffing. Fry the bacon over medium heat in a large frying pan until crisp. Add the apple, onion and celery stirring often until they soften. Add the butter and let it melt, then add the bread and currants and stir everything well to blend. Mix 1/2 cup (120ml) chicken stock with the mustard, thyme, sage, and poultry seasoning. Add to the bread mixture and stir well. Keep the heat low enough that the bread doesn’t crust. Add more stock as needed, up to 1/2 cup (120ml), being careful not to make the stuffing too soggy. 5. For the gravy, melt the butter in a small saucepan. Add the flour and cook until bubbling. Whisk in the stock, mustard, and cream and bring to a boil, stirring often, until it thickens. Keep warm. 6. When the chicken is finished resting carve it and toss the carrots with the pan juices. Pour any remaining pan juices into the gravy and serve it alongside the chicken with the stuffing. I'm an American immigrant to Sweden as of 2008. My blog is for people who like food, Scandinavia, or just think Swedes are hot. What an inspired idea! Looks delicious! It’s actually harder to do than you might think. You’re likely to go too light on the sage unless you have a quality “sage meter” on hand like Maia’s Mom. ratsonthepage: I have 8 Ikea rats and mice at home. They're alllll mine. mbnilsson: Hi Lisa! Those Rhodens must be my relatives! Please give them my best. Lanyon is a beautiful place. © Maia Brindley Nilsson and www.semiswede.com, 2011 & 2012. Unauthorized use and/or duplication of this material without express and written permission from Maia Brindley Nilsson is strictly prohibited. Excerpts and links may be used, provided that full and clear credit is given to Maia Brindley Nilsson and www.semiswede.com with appropriate and specific direction to the original content.